The Jester's Axe: Conventional Wisdom is not really "conventional." Conventional Wisdom is not really "conventional." Rudy is down in the polls TOO!!! This is a long race and the spectre of being the "inevitable candidate" is something that is hard to maintain. Especially if you are a two-faced, lying, conniving, co-dependent, power hungry, communist loving, wishy-washy, coat tail riding ex-first lady. Or a professional divorcee', RINO, anti-gun, pro-abortion, former New York City Mayor. This headline and survey appears today in USA Today, and I am sure that both campaigns are working damage control now. "National support for Democrat Hillary Rodham Clinton and Republican Rudy Giuliani significantly eroded over the past month," USA TODAY Washington bureau chief Susan Page writes. • Giuliani: 25%; vs 28% in the previous survey, taken Nov. 11-14; and 34% in a Nov. 2-4 survey. So, his support has fallen 9 percentage points in a month. that. Her support has fallen 11 percentage points in a month. The candidate who is no doubt most worried about this is Hillary. I mean, between a crazy guy taking her workers and volunteers hostage in New Hampshire, Senator Obama passing her in the polls in Iowa, and now this? Rudy has his issues, but his issues are much more related to how the Dinosaur Media continue to attack him and his personal life and character; as they continue to whore themselves out to Hillary. Rudy is the Republicans version of Bill Clinton. He is personable, easy to talk with, and is an eloquent speaker, but I don't think he will be the nominee. I find it darkly funny that Pat Robertson endorsed Rudy. I mean, doesn't THAT say something about what they think of Hillary. The problem with "inevitability" is that you can't lose one primary. You can't appear to be losing at any point. You have to pull a 1972 Dolphins move and win it all the way. If not, every loss is magnified, and projects you to be a loser. 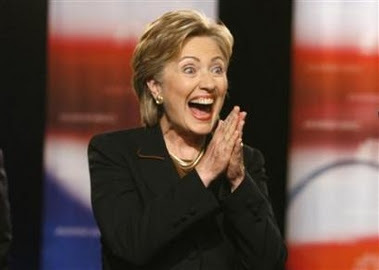 Prediction: Hillary will not win the nomination as the Democrat candidate. Rudy will not win the Republican nomination. From your keyboard to God's ear! Andrea - I'll send you a check to finance half those drinks! Can't find your email...just wanted to thank you for posting the roll of toilet paper on your sidebar. Keep it up! !